If you ever have a surplus of egg yolks, I would highly recommend making ice cream. My problem is generally the opposite, but I found myself with a little bowlful of yolks leftover from making the yule log, thanks to its Swiss meringue buttercream and meringue mushrooms. I gleefully handed the ice cream book to my dad and asked him to pick out something custard-based to take care of that little problem, and he put his finger down on Tin Roof Ice Cream, a delectable concoction of French vanilla ice cream layered with fudge ripple and chocolate-covered peanuts. It lasted us all of two days. My adjustments included using vanilla paste instead of a bean and 1% milk instead of whole in the custard. The resulting ice cream was nevertheless incredibly creamy and pleasantly perfumed with flecks of vanilla bean. I think, in fact, that it may have been my best vanilla ice cream effort to date. I cut the recipe for chocolate-covered peanuts in half to get the right amount for the ice cream, but I didn’t halve the fudge ripple and I have quite a bit of that leftover. Since polishing off the tin roof ice cream, we’ve already been eyeing the gianduja gelato, and I have a inkling that a fudge ripple would not be an unwelcome addition. Warm the milk, sugar, salt, and 1/2 cup of the cream in a medium saucepan (I added an extra splash of cream to bring the fat content closer to that of the original recipe, which called for whole milk). Pour the remaining cup of cream into a large bowl and set a mesh strainer on top. In a separate medium bowl, whisk the egg yolks. Slowly pour the warm mixture into the egg yolks, whisking constantly, then scrape the warmed egg yolks back into the saucepan. Stir the mixture constantly over medium heat with a heatproof spatula, scraping the bottom as you stir, until the mixture thickens and coats the spatula. Mix in the vanilla paste, then pour the custard through the strainer and stir it into the cream to cool. Stir this bowl until cool over an ice bath, then chill thoroughly in the refrigerator. Before freezing, make and chill the fudge ripple, then make the chocolate-covered peanuts and allow to harden. 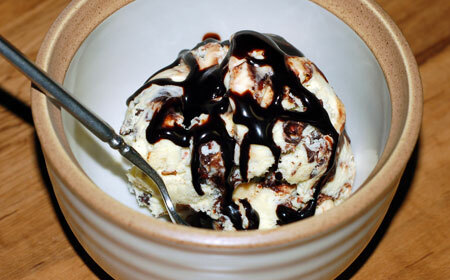 Freeze the ice cream in your ice cream maker according to the manufacturer’s instructions. 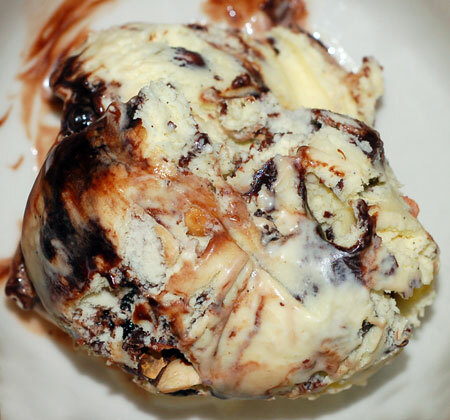 While the ice cream is freezing, chop the chocolate-covered peanuts into bite-sized pieces, and fold the pieces into the ice cream as you remove it from the machine, layering it with Fudge Ripple. Start with a puddle of Fudge Ripple in the bottom of the storage container and then alternate layers of ice cream with layers of sauce. Put the pices of chocolate in an absolutely dry heatproof bowl. Set the bowl over a saucepan of simmering water to melt th chocolate, stirring until smooth. In the meantime, stretch a piece of plastic wrap over a dinner plate. Once the chocolate is melted, remove it from the heat and stir in the peanuts, coasting them with the chocolate. Spread the mixture on the plastic-lined plate and chill in the refrigerator. Makes 3/4 cup. Continue to whisk until it just comes to a low boil. Cook for 1 minute, whisking frequently. Remove from the heat, stir in the vanilla, and let cool. Chill in the refrigerator before using. Makes 1 cup. photos are amazing. and looks really delicious.